Beef is the star here, so picking out the best-quality meat you can find is paramount. It doesn’t, however, have to be the most expensive cuts. 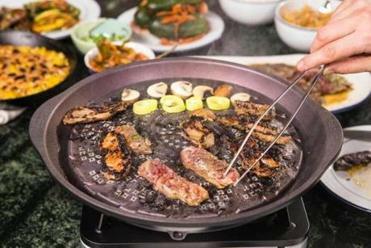 For bulgogi, skirt steak, hanger steak, and even sirloin tips are great. You can also splurge on rib eye or filet. My favorite for flavor and price is skirt steak. If you want to mix it up, feel free to add in sliced pork belly, which you can serve unmarinated for grilling. Korean grocery stores also sell high-quality pre-sliced meats. Skirt steak is marinated for bulgogi. 1. Make the marinade: In a blender, combine garlic, Asian pear, onion, and ginger. Blend to a smooth paste. Fierce flavors, spectacular sides, and the joy of tabletop grilling. 2. Stir in scallions, honey or syrup, soy sauce, sesame oil, and pepper. 3. 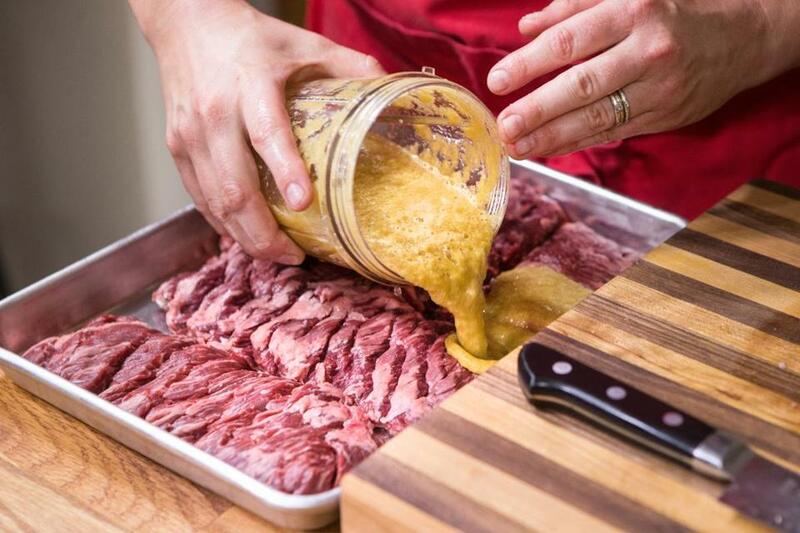 Transfer marinade to a dish that can hold all of the meat. Add steak and marinate, covered, in the refrigerator for at least 45 minutes and as long as 2 hours. 1. Divide the ssamjang among six dipping bowls. 2. Do the same with the sesame oil, and sprinkle each bowl of oil with salt and pepper. 3. Put the sliced scallions and kimchi in serving bowls, and the lettuce in a basket draped with a damp paper towel. 4. If using, arrange mushrooms, chile, and garlic for grilling in neat piles on a plate. Arrange all of the ingredients on the table with the banchan. Once all the dishes are out and everyone is seated, fire up the tabletop grill on high. Let folks know they can snack on banchan while they’re waiting for the meat to cook. When the grill is hot, set vegetables either at the center or off to one side. Load up the remaining space with meat. (If you are using both marinated and unmarinated meat, such as marinated skirt steak and unmarinated pork belly, cook the unmarinated meat first so the marinade doesn’t burn on the grill.) Cook the meat and vegetables to your liking, or share cooking duties with your guests. Add more meat and vegetables to the grill as needed. If items are cooking too quickly, lower the heat to medium. As the food comes off the grill, dip meat first in the sesame oil, then the ssamjang, then place it on a piece of lettuce leaf. Add grilled vegetables, sliced scallion, and kimchi to taste. Fold up the leaf into a little package, pop the whole thing in your mouth at once, and chase with soju or beer, if so inclined. If you want to make the meal more substantial, you can serve steamed white rice on the side. 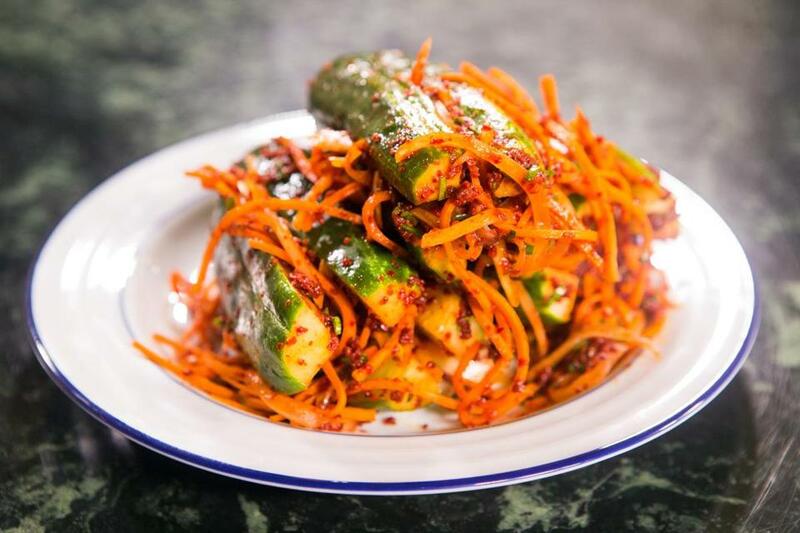 For this banchan, you will need gochugaru, chile flakes sold in Korean grocery stores. 1. Cut the cucumbers lengthwise twice, almost into quarters, leaving about ½ inch at one end to keep the pieces attached. Rub well, inside and out, with salt. Set aside for 20 minutes. 2. In a bowl, combine the onion, carrot, scallions, fish sauce, sugar, and gochugaru. Rinse off most of the salt from the cucumbers. Stuff each cucumber with the onion mixture and pack snugly into a container. Let sit for 30 minutes, or refrigerate for up to a week. 1. In a small saucepan, combine the rice wine vinegar, sugar, and salt. Over medium heat, bring to a boil. Stir, remove from heat, and let cool slightly. 2. Put sliced radish and pear in a wide bowl. Pour the vinegar mixture over and let sit for 30 minutes, or refrigerate for up to a week. 1. Bring a medium saucepan of water to a boil. Blanch the bean sprouts for 45 seconds, then drain into a colander. 2. In a serving bowl, combine garlic, scallions, gochugaru, soy sauce, and sesame oil. When the sprouts have cooled enough to handle, gently squeeze out excess water, place in the bowl, and toss well to coat sprouts with sauce. Sprinkle the sesame seeds on top, crushing them slightly between your fingers as you do so. This may not sound particularly Korean, but it is a popular drinking snack in Korea. 1. Preheat the broiler to high. In a shallow gratin dish, spread the mayonnaise liberally across the bottom. 2. Cut the corn off the cobs into a bowl; use the back of the knife to scrape any remaining juices from the cobs. 3. In a large sauté pan over medium heat, add the butter and garlic. 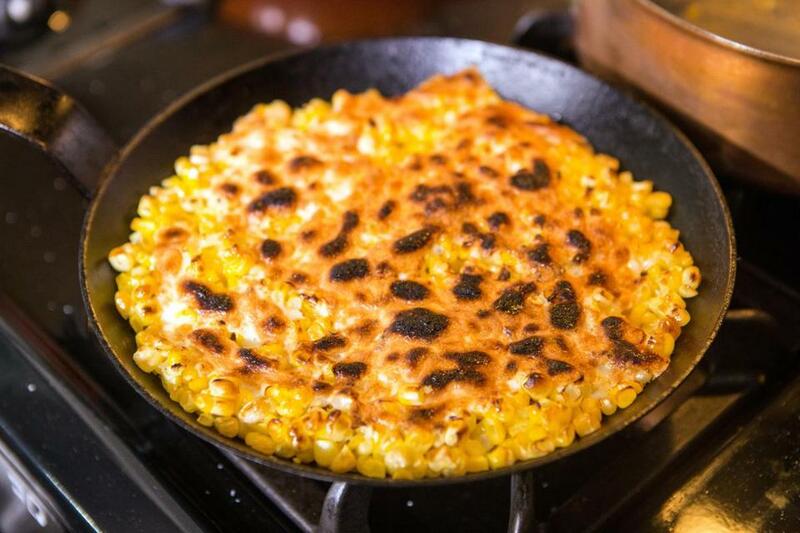 When the butter is foamy and sizzling, add all the corn and toss. Cook for about 1 minute. Add salt, pepper, and sugar, if you like. 4. Spread the corn in the gratin dish. Top evenly with the cheese. (Dish can be prepared up to this point a day ahead.) Put gratin dish under the broiler for a few minutes, until the cheese is melted and starting to brown in a few spots. Serve immediately. Alison E. Hearn is a chef who has worked at B&G Oysters, Myers + Chang, Steel & Rye, and more. She can be reached at alisonehearn@gmail.com.